I’ve been working on healthier, allergy-free meatball recipes since I discovered my food allergies in 1995. Let me tell you, recreating meatballs into a healthier, gluten-free, paleo, even egg-free variation that is equally delicious is no simple task. Built off of my original Italian meatball recipe, I think I finally cracked some codes when it comes to allergy-free meatballs! How do you replace veal, pork and beef (the Italian meat holy trinity) with ground turkey? Cooking blasphemy, no? If you use ground turkey that contains some dark meat you will retain a higher fat content than if you use all white meat. Fat adds flavor. 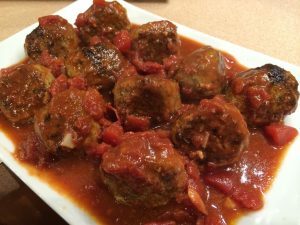 I find these meatballs super flavorful with all white meat, but if you love the dark meat or are struggling with changing your diet and leaving red meat behind, you can do it in steps. Moving from ground beef to ground turkey that contains some dark meat is a great step. Note that ground bison works great in this recipe. Closer in flavor to beef, I love making gluten-free, dairy-free bison meatballs for a healthier meatball option. Bison is lower in cholesterol than chicken and is quite low in fat! Just follow the same recipe below using ground bison for turkey. You can make these meatballs gluten-free or grain-free with the variety of breadcrumb options. Almond flour and ground pepitas are my favorite grain-free binders for meatballs. Both add flavor and healthy fats (remember fat adds flavor! ), while binding the meatballs. And, of course, if you eat grains, you have plenty of options for gluten-free breadcrumbs. I don’t find much difference in the final meatball using different gluten-free or grain-free binders. These meatballs are easy to make dairy-free. I find that unsweetened non-dairy milk works the same as regular milk to help keep your meatballs soft inside. The cheese, however, is a little trickier to substitute. Pecorino Romano, a sheep’s milk cheese, or Parmesan, a cow’s milk cheese, are hard salty cheeses. I use the Pecorino Romano because I am not allergic to sheep’s milk, only cow’s milk. The dairy-free Parmesan cheese makes a fine substitute for cheese in this recipe. If anything, you may need to add an extra touch of salt. IMO the dairy-free cheese is not as salty as the real cheese. The egg, as usual, is the toughest ingredient to substitute if you are egg-free. In our meatballs, the whites work as a binder, they create a lighter texture, and they add flavor. When replacing egg whites, I prefer flax seeds in this recipe because I like the nutty flavor the flax seeds provide. The flax egg will work as a binder and add flavor. IMO it won’t provide the lighter texture that egg whites give. That is the one difference I find with the egg-free meatball. Still delicious, just slightly different in texture. The milk, however, will help keep your meatballs soft, balancing this out. 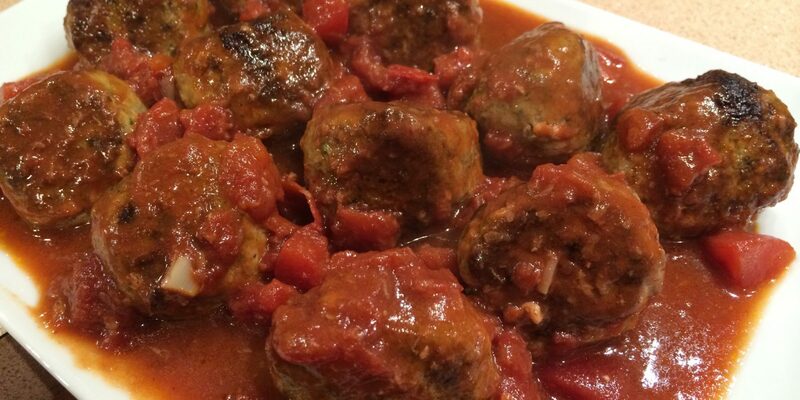 Can You Make this a Paleo Italian Turkey Meatball? Use almond flour or ground pepitas for the binder. Use the dairy-free Parmesan for the cheese. If the dairy-free Parmesan cheese doesn’t work for you, you can always use about 1 tsp of Ume Plum Vinegar for each TBS of cheese. Be careful, Ume Plum Vinegar is very salty, which is why is makes a great dairy-free swap for a hard salty cheese. Add a small amount at a time! If you use Ume Plum Vinegar for the cheese expect to add 2-3 TBS more binder (almond flour or ground pepitas) to compensate for the missing cheese. These Italian Turkey Meatballs were also featured in my Italian Marinara Quinoa Recipe in case you missed them! If you don't like sheep's milk cheese or vegan cheese as an option you can 1 tsp of use ume plum vinegar to substitute for 1 TBS of a hard salty cheese. Ume plum vinegar is very salty so add in small amounts, but this is why it makes a great dairy-free swap. If you go this route increase your almond flour or breadcrumbs by 2-3 TBS. Put ground meat in a mixing bowl. Spread apart. Add salt. Put garlic, onion, parsley, basil, cheese, red pepper flakes and broth in a food processor. Blend until all ingredients are finely chopped and it makes a slurry. Pour slurry onto ground meat. Add egg whites or chia/flax egg. Mix all ingredients into the ground meat with your hands until fully and evenly incorporated. Add bread crumbs, almond flour, or pepitas. Mix into the meat with your hands until fully incorporated. For best results, cover and refrigerate seasoned meat for at least 6-8 hours. Remove meat from fridge 20-30 minutes before ready to cook. Form 3-4 ounce meatballs and shape into balls. (I use an ice cream scoop). Heat a fry pan (I prefer an iron skillet), covered lightly with olive oil to medium/medium high heat. Place meatballs in the pan once it's hot. Sprinkle lightly with sea salt. Fry meatballs over medium to medium high heat until all four sides of the meatballs are brown, about 8-10 minutes. Cook to 165F if not transferring to sauce and eating immediately. If transferring to sauce, meatballs can be slightly underdone and finish cooking as they simmer in sauce for 15-20 minutes..
Line meatballs on a baking sheet. Lightly spray meatballs with olive oil. Sprinkle lightly with sea salt. Bake for 20-25 minutes and transfer to sauce.